Please see below a recommended list of equipment, clothing and accessories. You are welcome to order anything on-line and have it sent to Canyon Peak Ranch. We do have a limited range of skis for rent or to buy. If you are new to Super G we can try to help you out with lend pair. Tuning boxes will be supplied to all live-in athletes for store all their tools/wax in whilst they are at Canyon Peak Ranch. See the tools and the wax sections ordering options. You will need a bootbag to transport your boots, helmet, goggles, spare socks, lunch, drink bottle, sunblock/lipbalm, tissues etc particularly for races. Its also a good idea to have small back pack for other occasions which you can always use as your carry on bag. Peak has a limited stock of ski’s to be hired or sold if it helps. 1 set of GS, 1 set of Slalom 1 pair of free skis – suitable for powder skiing is more than adequate for the Dec-Jan period of training as the number of races will be limited. If you are U14’s or older or training for the Dec-April period we would recommend you have 2 sets of GS and Slalom. 3 straps for each set of race ski’s. 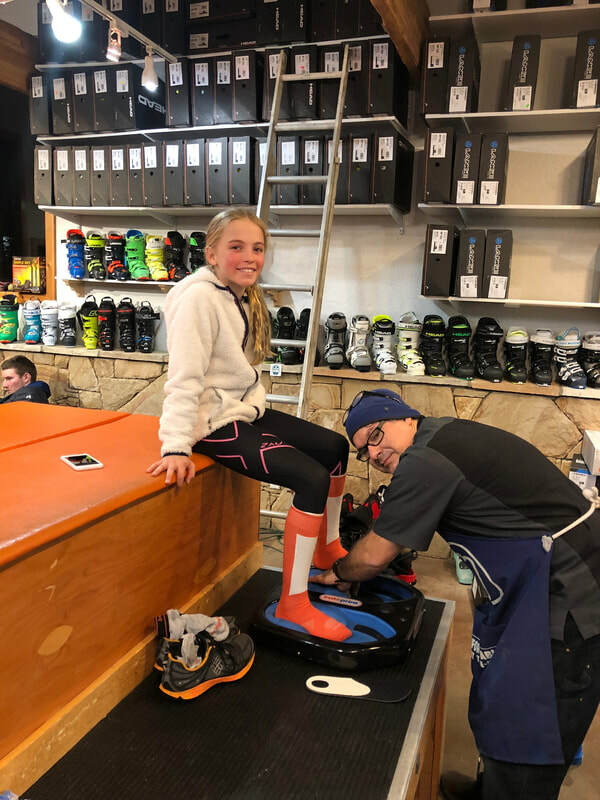 We recommend that athletes are custom fitted with race boots and we have an association with ski race boot fitters at the highest level of expertise. Cat-tracks fitted to your boot size to protect your boots are also a good idea. 1 Helmet is sufficient if has a removable slalom bar that can be taken off for GS or Super G, however the athlete will need to carry a screwdriver and extra screws for the Slalom bar as they are easily lost. As a result many of the athletes utilize 2 helmets, 1 set up permanently for slalom and 1 for GS. We recommend a mouthguard for slalom training/racing these can be purchased in any chemist or sportstore. Padded race suits are required for all athletes that are racing. We strongly recommend that all athletes use a back protector for training and racing. We recommend 2 pair of padded race gloves and 1 pair of free-sking gloves. 2 pair is sufficient for the younger races and those training Dec-Jan.
Warm/water proof jacket, Peak jacket is perfect and a requirement if you are racing, which can be purchased at the time of booking. Zip off warm pants are required. Raincoats are really not necessary here however as many Australians have them for our wet snowy weather feel free to bring them. For those of you booked for the Dec-Jan or Dec-April program you will get a T-shirt/Hoodie/Cap. Layers are the best way to pack for the snow so we would also suggest a mid-weight soft jacket to wear on its own or under your jacket. A beanie/wollen gloves are also great accessory. Swimsuit for the spa and swimming. Ski socks: Usually the best socks are thin poly propylene and it is highly recommended that you carry a spare pair of socks in your boot bag. We would suggest you bring at least 7 pairs of socks. We will have a pump-pack of Sunblock at Canyon Peak Ranch however its good to have a small one in your bag and also good idea to have lip balm or even a couple. A must for your boot bag! We are looking at having spares at Canyon Peak Ranch as it seems like socks drink bottles are always going walk-about!!! Peak will supply all linen, towels, laundry detergent however you will need to bring your own toiletries. We will have basic items for you like soap if you need it and of course we will help you sort out anything you have forgotten. A diary/notebook/pen to take notes about your training or things you need to follow up with your parents or things you want to ask Tracie for! Money for extra activities on your day off and for dinners out. Don’t forget to pack your smile, hard work ethic and positive attitude! Athletes need to take care of, and learn to take care of, their own equipment. At Peak we have a full tuning room that provides benches, irons and vices with the ability to have 7 athletes tuning at any one time. The athletes will be required to tune their ski’s each day with supervision/training from Darren & Jaka plus we will run tuning clinics. Should you require your ski’s to be ground we can arrange this with Podium Ski Service in Park City who are excellent for race grinds. Athletes will be required to bring their own tuning tools and wax. These can be purchased in the US on line and sent to Canyon Peak Ranch or feel free to give your order to Darren and he will place your order for you and attempt to obtain a discount. All athletes should have a tuning box with the following in it. Live-In athletes will be provided with a tuning box to utilize during their stay. School Holiday program - $135 includes all training wax, race wax and overlays.